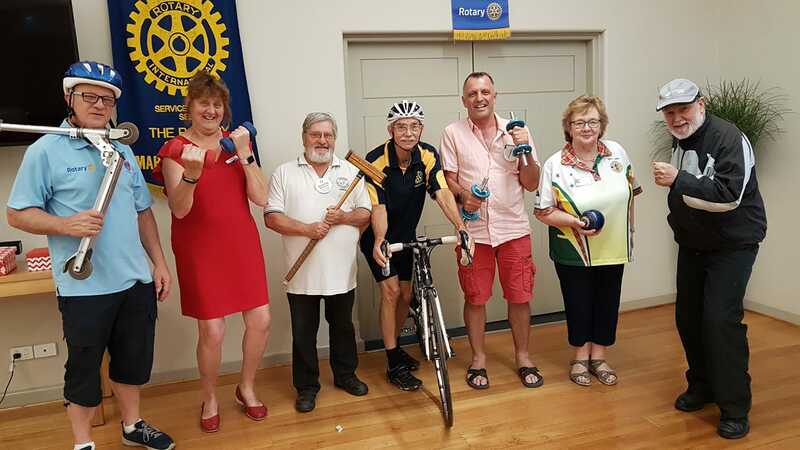 As members will be aware, one of the spin offs from our hosting of this year's District Conference is the Activity Challenge championed by Rotarian Peter Haywood. Peter and his wife, Bronwyn plan to ride over 2000km around our District in the 9 days before Conference to raise awareness of the need for us all to be more active in our lifestyles. Our club is sending out the challenge to all other clubs in the District to add up the total amount of time their members spend being active in those 9 days leading up to the Maryborough conference, and the most physically "active" club will win a trophy to be presented at the Conference. The total number of hours will be divided by the active members in each club to determine the winner. Pictured are some of our club's members getting psyched up for the challenge. "Activity" can be anything that demands physical exertion and movement such as scooting, weight exercising, playing croquet, riding your bike, playing bowls, walking or jogging, yoga, swimming, dancing, mowing the lawn, active housework, shopping etc.